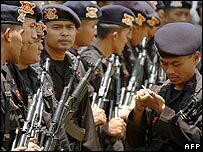 A Christian priest has been shot dead on Indonesia's Sulawesi island, where religious tensions are high after the execution of three Catholic militants. The Rev Irianto Kongkoli was shot in the head while shopping in Palu, the capital of Central Sulawesi province. Relations between Christians and Muslims in Central Sulawesi have been fraught since the execution of the three militants last month. They were found guilty of inciting attacks against Muslims in 2000. It was part of a wave of religious violence between 1999 and 2001 that left more than 1,000 people dead. The Rev Kongkoli was buying construction materials at a shop when he was targeted, a spokesman for the provincial government's information bureau said. "He had finished bargaining for some tiles when someone called him back into the store. When he entered, two shots were fired at the back of his head," Jethan Towakit told Reuters news agency. Central Sulawesi governor Bandjela Paliudju told reporters he believed the killing may have been linked to last month's executions. "He was an outspoken priest who many times led Christian protests against the executions," Mr Paliudju said. A police investigation is underway. "We need to make sure such killings do not happen again," national police chief Gen Sutanto said. Fabianus Tibo, Marianus Riwu and Dominggus da Silva were killed by firing squad on 22 September, despite a plea for clemency from the Vatican and concern at the fairness of their trial by human rights groups. Although the protests and rioting that followed the executions quickly calmed down, there has been sporadic violence since. Indonesia is home to the world's largest number of Muslims. But in various eastern areas of the country, such as parts of Sulawesi, Christian and Muslim populations are roughly equal.